Sometimes people’s names just fit: Computer pioneer Steve Jobs, who created quite a few of them. Olympic track champion Usain Bolt, who certainly can run. And Canadian Music Hall of Famer Robert Jens Rock, who has lent his production acumen to so many albums by today’s hardest-hitting and most successful bands that saying, “This record needs to Rock,” might as well be how they come to work with him. And those who’ve worked with him aren’t just a who’s who of hard-rocking juggernauts, but also include some surprising artists. In 2014, for example, Rock won a Grammy Award for Best Traditional Pop Vocal album for his work on retro-crooner Michael Bublé’s To Be Loved. 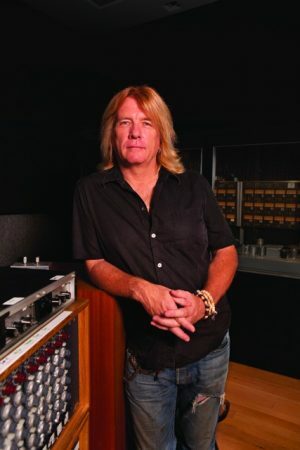 In the following interview, Rock tells us that his lifelong use of Celestion guitar speakers was a natural springboard into his recent adoption of Celestion Impulse Responses — the digital tonal versions of classic Celestion drivers — meant for use in today’s profiling amps, modeling software, and convolution-processing audio plugins. You’ve produced hits for a diverse range of artists both inside what we might call the hard rock and metal genres. Two of the earlier successes people associate you with are Metallica and Mötley Crüe. Before you’d heard of impulse responses or they even existed, how did you get some of these signature tones? For most guitar sounds I need to get, whether it’s been for James Hetfield of Metallica or Mick Mars of Mötley Crüe, the drivers in the amps have been Celestion. Whether the head is a Boogie or a Marshall, it’s always Celestion in the cabinet. Which speakers in particular do you like? I like the low-powered Greenbacks in a 4×12″ configuration. Same with the Creambacks. Sometimes I also like a single 12″ Red in an open cabinet. When I find something that has a character I like, I tend to stick with it. When tracking, I also like to get the guitar player really involved with getting the sound, moving the mic to find a sweet spot, and so on, and usually with Celestion speakers that process is very quick. Okay, let’s fast-forward to how you first heard about impulse responses. I first heard about the Celestion IRs through my friend Alexander Dumble, who makes the boutique Dumble amplifiers. I then learned more about them from Rick Skillman at Celestion, and loaded all the IRs into my Kemper Profiler amp, which I use a lot for pre-production and when I need to audition demos. When I do these kinds of demos, I work very quickly and I end up keeping a lot of what happens. I have go-to sounds, and with the impulse responses, I always find something that makes it more real. The Greenback and the Creamback — those are my go-to here just like with the actual speakers. We’re glad our IRs are convenient and let you work quickly. But can you talk about their sound quality as compared to ways others might work quickly — say, with some generic plugin effect from their DAW software? Absolutely. There’s this amazing thing that just happened. I was mixing this stuff that had average, in-the-box sorts of guitar sounds, because as you said, when you’re doing something quickly, you just grab whatever works. The engineer I work with, Adam Greenholtz, loaded all the IRs into a plugin so we could just go through and audition all the profiles in the context of the mix. I put the Celestion IRs on the guitars and — oh my God! It was like re-amping, only really easily. So, is it fair to say they’ve been life-savers on occasion? I’ve been mixing my whole life, and I’ve had to re-amp some truly horrible guitar sounds along the way. It helps that I’ve used (physical) Celestion speakers for so long and know the sound I’m looking for, but with the IRs, you can take a bad guitar sound and make it actually quite good and fit it into the mix very quickly. What are the most current projects on which you’re using either Celestion hardware or impulse responses, or both? I just used it on something with Richie Sambora (of Bon Jovi fame) and I’m also working with a young guy from Montreal named Travis Cormier, who was a winner of the French-Canadian version of the singing competition show The Voice. I just used the Greenback on a mix with him. What impulse responses would you like to see us release next? This is just the beginning of the possibilities, as I’m looking forward to more speaker profiles I’ve heard may be coming. I want to see the seriously vintage stuff, like pre-‘Rola’ speakers. That’s what we call ‘Bob food’! I’d also like to see Celestion do a simple plugin designed for hosting the impulse responses and auditioning them quickly — one that doesn’t use a lot of CPU power. I’ve used stuff (convolution plugins) like AltiVerb in the past, but that was almost too much of a plugin for my use case. Would you recommend our IRs to colleagues, or even to beginners who aspire to a career like yours? The Celestion Impulse responses are a sonic revelation — great choices for my Kemper Profiler and my in-the-box plugins. They’re a must-have for pro studios and home recordists alike. Thank you, Celestion. You rock!